New Shipping Containers to your door. Hiab or swinglift on to your site. Ask for a delivered price. South Island wide. From Canterbury to the West Coast - Golden Bay to Southland and anywhere else a truck,trai­n,ship can go. Based in Canterbury we are a small 100% kiwi owned family business that cuts out the middle man and ensures $NZ stay right here in New Zealand. Cubex is a member of "Site Safe NZ"
New from $4395.00 (on selected containers and subject to availability). 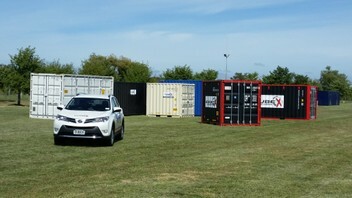 ChCh container hire 10 & 20ft available. All new containers available in NZ have been used for freight on a one way voyage from China to NZ. Some may have scuffing from being on the boat and may have a few small dents. Containers are all built NEW in either India or China not in NZ. "THIS IS THE NEWEST YOU CAN BUY A NEW CONTAINER IN NEW ZEALAND"